The only thing that compares to a great day of surf would be an entire festival dedicated to the sport. Thanks to the San Onofre Foundation, Doheny State Beach Interpretive Association, Subaru, Kona Brewing and California State Parks, we got to rock out for the entire day with surf, food, music and drinks at the Doheny Surf Festival. The Doheny Surf Festival in Dana Point, California was an incredible event organized for the purpose of protecting the most popular beaches in the area including San Onofre, San Clemente, Trestles and Doheny State Parks. These four state beaches, monumental in surf history and frequently visited by California surfers and global travelers alike, are at risk as the state of California suffers from budget reductions. The San Onofre Foundation is willing to do whatever it takes to save these precious gifts. The Saturday and Sunday event had various performances by awesome surf inspired bands, such as Eddie Money, FishBone, Common Sense, ALO, Honk, Paula Fuga and, one of local favorites,The Originalites. These bands entertained over 3,500 guests as they perused the eco-friendly booths of retail shops, artists, photographers, athlete autograph signings, non-profit organizations and just about any type of surf equipment you could think of. And, of course, what would the event be without the waves? Doheny had gorgeous sets rolling through Saturday and Sunday for the legends expression session, tandem surfing and nose riding friendly competitions. Doheny Surf Festival put on an exiciting show and we are stoked to check it out next year to help save our gorgeous beaches and blissful surf. Eric Diamond raised his paddle above his head in victory as he caught a wave and glided to shore on the 12-foot Stand Up Paddleboard, taking first place in a fun race at Doheny State Beach. The Victory SUP-Cross demo – where paddlers raced from buoys in the water than sprinted on land – was just one of the shows put on in the water Saturday as part of the Doheny Surf Festival, an event that drew big beach crowds on a hot day looking to get relief from the heat while enjoying the surf culture. “It’s probably the best race you can watch. It’s really hard to catch waves on the race boards, so when you come in you might have four guys on a wave and you run into each other,” said Diamond. The festival has been going on four years, but this year was expanded to a 2-day, much larger event to raise money for State Parks in Southern Orange County, which include Doheny, San Clemente, Trestles and San Onofre. The area is rich with surf history, like in the 1920s when Lorin “Whitey” Harrison and Peanut Larson came down to discover the new surf break San Onofre, Kempton said. Food trucks offered up grub through the day, and about 100 booths lined the grassy area at Doheny showcasing everything from surf art to custom jewelry to the latest surf-related products. Leila Endersby – a trainer for Indo Boards – was balancing on an SUP and showcasing how the product can help build core strength to help for those days when waves are flat or the windy is too tough to paddle. “The Indo Boards are all about having fun, as you are having a great work out,” she said. Down the way surfboard maker Bill Stewart, from San Clemente, was showcasing his surfboards. He said he was glad to see an event that helps out State Parks, and that surfing is a sport enjoyed by people from every walk of life. Those areas were free to those who wanted to enjoy the exhibits, though tickets were required for the music performances through the evening, which included Honk and Eddie Money. The headliner for Sunday, Everlast, is expected to bring big crowds. Down at the water’s edge, there was everything from nose riding to tandem surfers and a group from Wounded Warriors who took to the waves to put on a show for beach crowds. That’s where Darcy Patch, of San Juan Capistrano, was enjoying the afternoon with her family. An epic weekend of sun, sand, surf and rockin’ music awaits at the Doheny Surf Festival on August 11th and 12th, from 10 a.m. to 9 p.m. at Doheny State Beach in Dana Point. An expanded version of the summer event that’s been held for the last four years, the 2012 Festival will include all things surf, combined with a major music lineup and an opportunity to support Southern California state parks and beaches. The Doheny State Beach Interpretive Association (DSBIA) and the San Onofre Foundation (SOF) have teamed up to present the Doheny Surf Festival to benefit San Onofre, San Clemente, Trestles and Doheny State Parks. Nearly 70 state parks are slated to close in 2012, and the budgets for the remaining parks are being slashed. The DSBIA and the SOF are California non-profit public benefit charitable corporations, dedicated to protecting our treasured state parks and beaches. These organizations depend on donations to preserve and operate these parks for the two million people who visit them annually. The Festival offers a weekend filled with top-notch, live entertainment. Headlining this year’s event on Saturday is Eddie Money, with Everlast taking center stage on Sunday. Fishbone, Common Sense, ALO, Honk, Paula Fuga, Le Blorr and other bands will entertain an expected 3,500 attendees throughout the weekend. Tickets are on sale now and range from $29 for general admission to $92.70 for a VIP pass, which includes a preferred viewing area, a Rubio’s buffet and two tickets for beverages provided by Kona Brewing, Longboard Winery and Peligroso. Buy your tickets early at DohenySurfFest.com as prices increase at the door. The Doheny Surf Festival is a “green” event that will also feature surf demonstrations, surf star autograph signings, outrigger canoe & SUP exhibitions, a legends expression session, tandem surfing, nose riding, a woody car exhibit, vintage surfboards, a Kids’ Corner, environmental and ocean education and much more. There will be something for everyone in Vendor Village. Beer, wine and margaritas will be available in the Kona Brewing beer garden. Fantastic fare and beverages will be served by L.A. Gourmet Food Trucks and eateries that have supported surfing through the years. Doheny State Beach became California’s first state beach on May 31, 1931. Steep in surf culture, it remains one of Southern California’s most famous beaches and is one of California’s most popular camping grounds. The beach covers an area of 62 acres and includes a day use surfing beach at the northern end, as well as campgrounds in its southern area. For more information and to purchase concert tickets, be sure to visit DohenySurfFest.com. In 2009, the Surfrider Foundation helped lead a successful effort to save Trestles and San Onofre State Park resources by stopping a planned extension to the 241 FTC Tollroad. As important as that effort was, it’s equally important that we continue to maintain and preserve these assets for future generations. To help with this effort, our friends at the San Onofre Foundation are hosting the Doheny Surf Festival on August 11th & 12th in Dana Point, CA. This exciting event will feature a host of surf-related exhibits, art, apparel and memorabilia, as well as surf demonstrations, environmental education, autograph signings and Outrigger Canoe and SUP exhibitions. The event will also feature unforgettable concert performances by Eddie Money, Everlast, Fishbone, ALO, Honk, Common Sense, Paula Fuga, and Le Blorr. 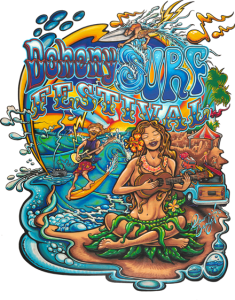 Dana Point, Calif., July 18, 2012 – The Doheny State Beach Interpretive Association (DSBIA), San Onofre Foundation (SOF) and Utopia Entertainment, Inc. are producing the Doheny Surf Festival coming to Dana Point, CA, August 11-12. This fundraising event helps support San Onofre, San Clemente, Trestles and Doheny State Parks. The two-day event, presented by Subaru along with supporting sponsors Kona Brewing and Rubio’s, is an expanded version of the summer surf event that has been held for the last four years. It will include all things Surf: exhibits, woodies, vintage surfboards, music, tandem surfing, nose riding, Outrigger Canoe and SUP demonstrations, Kids’ Corner, environmental and ocean education, state park wildlife, autographs and photo opportunities with surf legends as well as current professionals. A major music lineup includes headliner Eddie Money, as well as Everlast, Fishbone, ALO, Honk, Common Sense, Paula Fuga, Le Blorr plus others will entertain 3,500 concert attendees each day. 20,000 attendees are expected to visit Doheny beach during the two-day event. Doheny State Beach became California’s first state beach on May 31, 1931. Steep in surf culture it remains one of Southern California’s most famous beaches and is one of California’s most popular camping grounds. The beach covers an area of 62 acres and includes a day use surfing beach at the northern end, as well as campgrounds in its southern area. In an effort to preserve state parks threatened by closure, the Doheny State Beach Interpretive Association and the San Onofre Foundation have teamed up to present the Doheny Surf Festival on August 11 and 12. This two-day fundraising event will feature all things surf, including exhibitions, demonstrations and autograph-signing opportunities with some of the sport’s premier talent. Food and drinks, including the Kona beer garden, will be available as well. Top food vendors, such as Serena Mexican Grill, Daphne’s California Greek and Nalu’s Island Grill will be on hand to serve guests. Live musical performances will be provided by artists such as Honk, Common Sense, Paula Fuga, Le Blorr and others. State budget cuts are forcing the closure of nearly 70 state parks. Many nonprofits have come to the forefront to save and support threatened parks and beaches. The Doheny State Beach Interpretive Association and the San Onofre Foundation are committed to preserving San Onofre, Doheny and San Clemente state beaches. Dana Point, California: The Doheny State Beach Interpretive Association and San Onofre Foundation are producing the Doheny Surf Festival August 11 & 12, a fundraising event for the Southern Californian State Parks and beaches. The two day event is an expanded version of the summer surf event that has been held for the last four years. It will include all things surf: exhibits, surf demonstrations, environmental education, surf star autograph signings, tandem, outrigger and SUP exhibitions. A major music line-up includes Honk, Common Sense, Paula Fuga, Le Blorr, ALO, Fishbone, and big name surprises that can’t be promoted yet due to other engagements in the area. 20,000 attendees are expected. Nearly 70 State Parks are slated to close in 2012, and the budgets for the remaining Parks are being slashed. The SOF and DSBIA are California non-profit public benefit charitable corporations, dedicated to protecting the treasured State Parks of San Onofre, Doheny, and San Clemente State Beaches. The event will be held in the peak of summer where the maximum number of attendees can enjoy the music, exhibits, surf, art and memorabilia. Beer and wine will be available in the Kona beer garden; great food fare will be served by top food vendors who have supported surfing through the years, among them Serena Mexican Grill, Daphne’s California Greek, and Nalu’s Island Grill. For Booth and Vendor applications, contact Malia Murray at: SurfFestSales@gmail.com. The Doheny State Beach Interpretive Association (DSBIA) and the San Onofre Foundation (SOF) in conjunction with California State Parks presents the Doheny Surf Festival 2012, August 11 & 12, a fundraising event to help protect the treasuredSan Onofre, Doheny and San Clemente State Beaches. Doheny Surf Fest 2012 has partnered with Subaru as the title sponsor. “We are very pleased to have Subaru and many other great sponsorship partners onboard. This year’s event will certainly be the highlight of the summer,” says DSBIA President, Bill Brooks. The two day event is an expanded version of the summer surf event that has been held for the last 4 years. As one would expect–it will include all things Surf: exhibits, art, surf demonstrations, music, environmental and ocean education, surf apparel, memorabilia, current and past surf star autograph signings along with tandem, Outrigger Canoe and SUP exhibitions and much more. Beer and wine will be available in the Kona Brewing Co. beer garden; great food fare will be served by top food vendors who have supported surfing through the years, among them Serena Mexican Grill, Daphne’s California Greek, and Nalu’s Island Grill. “We wanted to be sure we included fun activities for the entire family. This kind of event will remind and educate people how important it is to preserve our State Parks and State Beaches.” says Jim Kempton, Festival Director and CEO of the San Onofre Foundation. For more information on Doheny Surf Fest 2012 visit dohenysurffest.com. For Booth and Vendor applications, contact Malia Murray at SurfFestSales@gmail.com. The Doheny State Beach Interpretive Association (DSBIA) and the San Onofre Foundation (SOF) are producing the Doheny Surf Festival August 11 & 12, as a fundraising event for the State Parks. The two day event is an expanded version of the summer surf event that has been held for the last 4 years. It will include all things surf: exhibits, surf demonstrations, environmental education, surf star autograph signings, tandem, outrigger and SUP exhibitions. A major music line-up includes Honk,Common Sense, Paula Fuga, Le Blorr, and big name surprises that can’t be promoted yet due to other engagements in the area. 20,000 attendees are expected. The Doheny State Beach Interpretive Association and the San Onofre Foundation are producing the Doheny Surf Festival August 11 & 12, as a fundraising event for the State Parks. The two day event is an expanded version of the summer surf event that has been held for the last 4 years. It will include all things surf: exhibits, surf demonstrations, environmental education, surf star autograph signings, tandem, outrigger & SUP exhibitions. A major music line-up includes Honk, Common Sense, Paula Fuga, Le Blorr, and a couple of big name surprises that can’t be promoted yet due to other engagements nearby. 20,000 attendees are expected. Nearly 70 State Parks are slated to close in 2012, and the budgets for the remaining Parks are being slashed. The SOF and DSBIA are California non-profit public benefit charitable corporations, dedicated to protecting the treasured State Parks of San Onofre, Doheny and San Clemente State Beaches. The event will be held in the peak of summer where the maximum number of attendees can enjoy the music, exhibits, surf, art and memorabilia. Beer and wine will be available in the Kona beer garden, and great food will be served by top food vendors who have supported surfing through the years, among them Serena Mexican Grill, Daphne’s California Greek, and Nalu’s Island Grill. the park’s main stakeholder groups, including surfers, cyclists, campers, hikers, Native Americans, the Military, environmentalists and others.